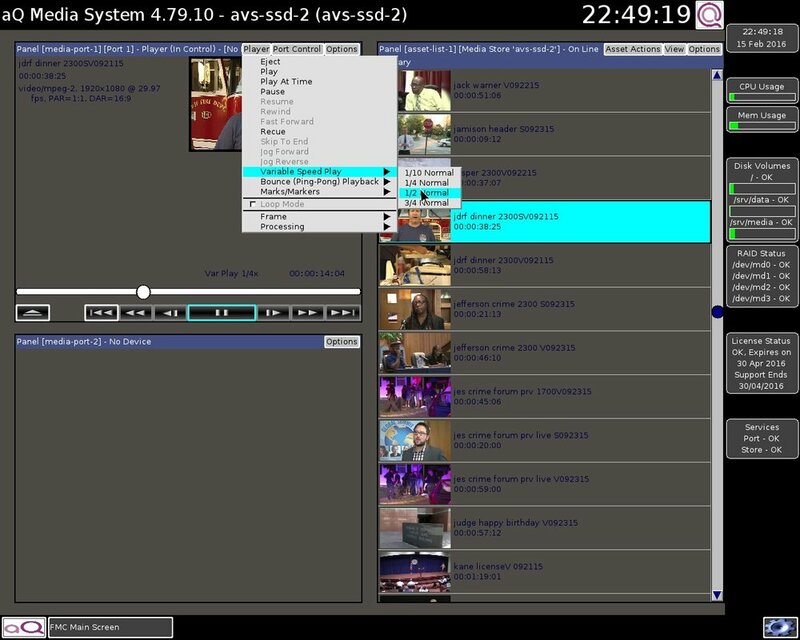 The latest firmware from aQ Broadcast allows the user to create and configure custom layouts for the Graphical User Interface (GUI), rather than restricting the appearance to a single view. For instance, for a four-port server, one layout might have four port control windows laid out in a single vertical stack, whereas another might have the same windows laid out in a two-by-two square. Both layouts provide the same overall functionality, but the option to configure different arrangements and then swap between them allows the user to choose the appearance which suits them best. Some examples of different layouts are shown below, but there is no limit to the number and type of arrangements. The main Operation Interface (Flexible Media Controller - FMC) can be run directly on aVS (aQ Video Server) hardware, or remotely on appropriate Windows PC or Linux (aQ Distribution) workstations. The principle of configuring the GUI is exactly the same regardless of the platform it is running on. FMC running on a networked PC provides a particularly flexible configuration, since it allows resources and operation to be shared amongst multiple users. It is also possible (with appropriate configuration) to access the aVS screen via VNC remote desktop. This allows the server to be controlled remotely over the network, using the same screen layout as currently running locally. In this case, local and remote users must share access to keyboard and mouse. The Operation Interface can be configured to show one or more elements, or ‘Plugins’, providing a range of different functionality. Each Plugin has a fixed specific size, location and function, but can be switched on-the-fly by the user to address a different component within the system. So, for instance, a single Media Port Plugin, which provides transport control over a single, standard Input/Output port, could be controlling Port 1 initially and could then be switched to control Port 4 instead. In this case, the operation of a Port is not dependent upon having a Plugin attached to it – i.e. it is perfectly possible for a Plugin to take control of Port 2, start playback of a clip, then disconnect from that port and take control of Port 3. The action of disconnecting from Port 2 will not stop playback on that port – it will continue in the background until the end of the clip is reached or another Plugin takes specific control and stops playback. The overall arrangement of Plugins within a GUI is referred to as the current ‘Skin’. Any number of different Skins can be designed, and the user can switch from one Skin to another at will. This allows for different sets of devices to be controlled from similar layouts and also for the same set of devices to be controlled from different layouts. Any Skin can contain multiple 'Pages'. Having multiple pages provides an effective way to swap between different sets of plugins more quickly than by moving from one Skin to another. So page-1 of a Skin might contain the operational plugins used most often, whereas page-2 might contain associated configuration elements that are used less frequently.